An outdoor space doesn’t have to be boring. Check out our photo gallery on BannochieBuildersInc.com to see examples of Quality Deck Construction completed for past and present clients. If you can dream it – we can build it. There are many high-quality decking materials available today. Bannochie Builders, Inc. stays current on all of the latest trends and materials that create long lasting Deck Additions. You can choose from an array of traditional or maintenance free deck solutions. Nothing is as important as proper planning and a solid foundation. Our team never compromises on quality to ensure that your new backyard deck is solid and will last for years of enjoyment. We will discuss with you your budget and design ideas to provide the best solution for your new Deck Addition. What better place to host a summer barbeque than your own spectacular Patio Addition? Bannochie Builders, Inc. provides the expertise that can design and create the perfect outdoor living space for your yard. Each custom designed patio is designed to optimize the space that you have on your Minneapolis, MN property. Depending on what you hope to achieve for your home, we can create a cozy spot to enjoy morning coffee or an evening glass of wine or design an elegant outdoor entertaining room. There are countless options for pavers, concrete, stone or maintenance free solutions. Your new Custom Patio can compliment a deck addition or be perfect on its own. Contact Bannochie Builders, Inc. for the perfect solution to Spring Fever. 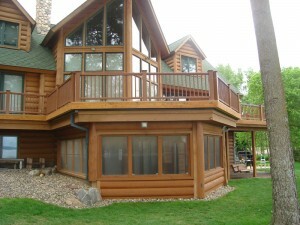 We are Expert Minneapolis, MN Deck Builders. Our team creates outdoor spaces that compliment your home and provide the perfect place to entertain family and friends. A Patio Addition or Deck Addition adds valuable outdoor living space that can be enjoyed year after year. See what Bannochie Builders, Inc. can do to provide Quality Construction for any budget and backyard. Contact us today for a Free Estimate on a Deck Addition or Patio Addition. This entry was posted	on Wednesday, March 18th, 2015 at 4:27 pm	and is filed under Deck Builder. You can follow any responses to this entry through the RSS 2.0 feed. You can leave a response, or trackback from your own site.